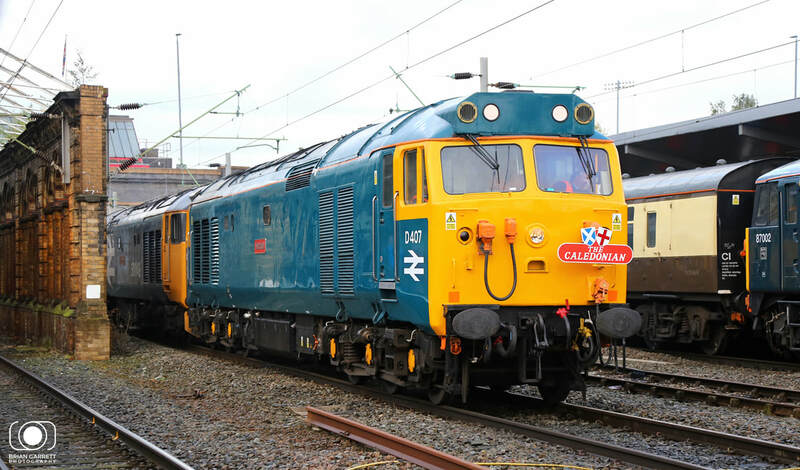 It had been 10 years 3 months since I'd last had the pleasure of experiencing mainline Class 50 rail tour so when the opportunity arose for a 50th Anniversary special behind a pair of Class 50s taking them back over their former stomping ground between Crewe and Glasgow I knew I had to be there...... no matter what. Saturday 7th October 2017 had been fast approaching over the previous weeks, but our journey would begin on the evening of the 6th October. After full days work there was ample time to return home, have a shower, cook some dinner and then get to the station in time to catch the 19:36 GWR service to London Paddington. 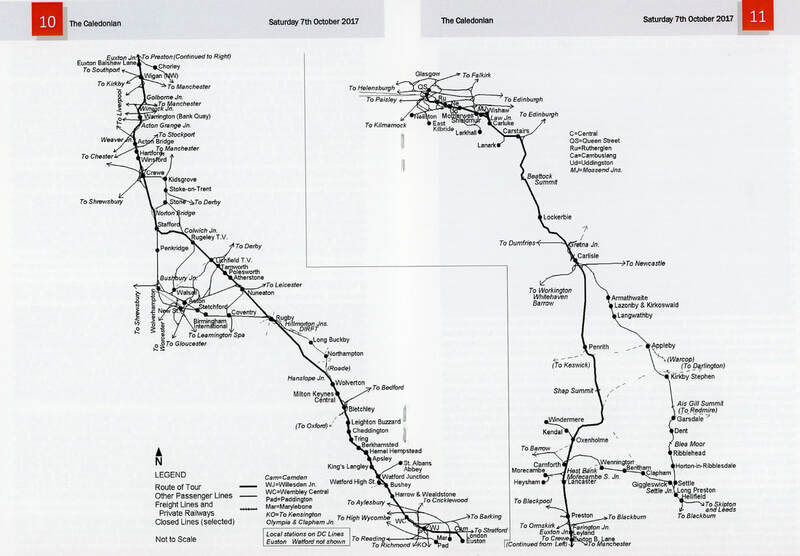 Joining me on this trip would be a band of enthusiasts all of whom shared a passion for trains, travel, railways and the odd alcoholic beverage. Arrival at Taunton station was met with tales from Station Staff of other enthusiasts having already passed through the station making the same pilgrimage to either London or Crewe, in preparation for the next days event. Our Great Western HST rolled into Taunton on time at 19:33, running as the 1A94 19:36 Departure from Taunton, 43069 and 43159 were set to whisk us to London with a non stop run along the Berks and Hants route to Reading. 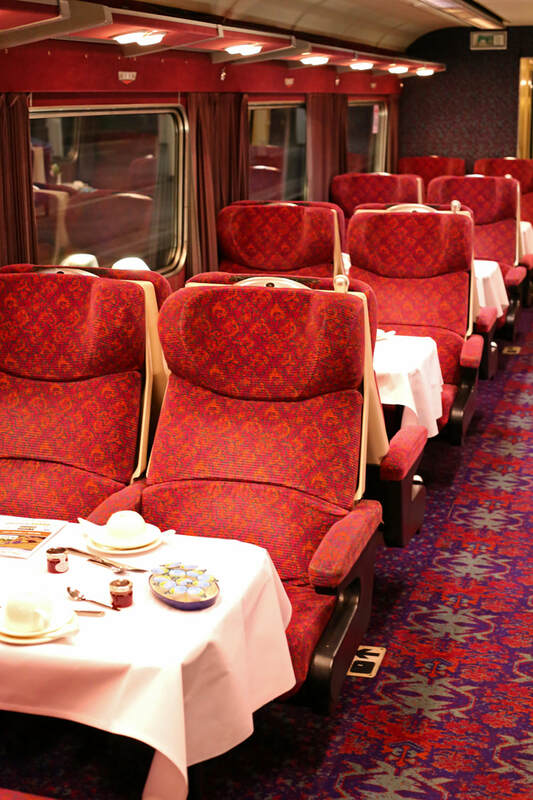 The train having originated in Penzance was understandably busy for a Friday night but we had seats reserved in Coach B. The journey into the black of the night from Taunton was uneventful, apart from the usual minor delays catching late running trains in front, causing us to slow on occasion. 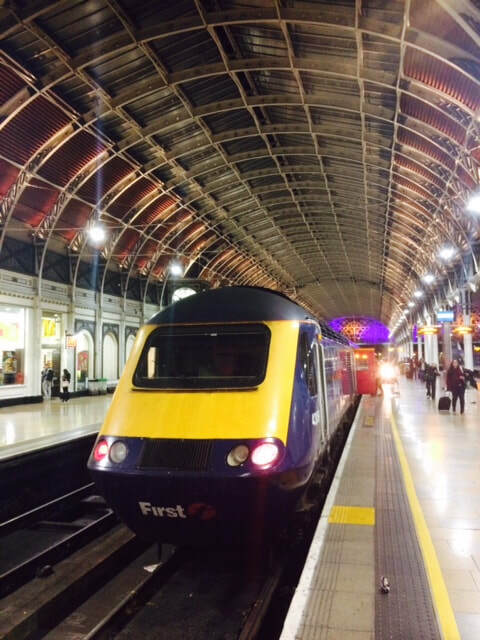 The beauty of the 1A94 is its non stop run between Taunton and Reading and late evening arrival (21:22) into London Paddington. 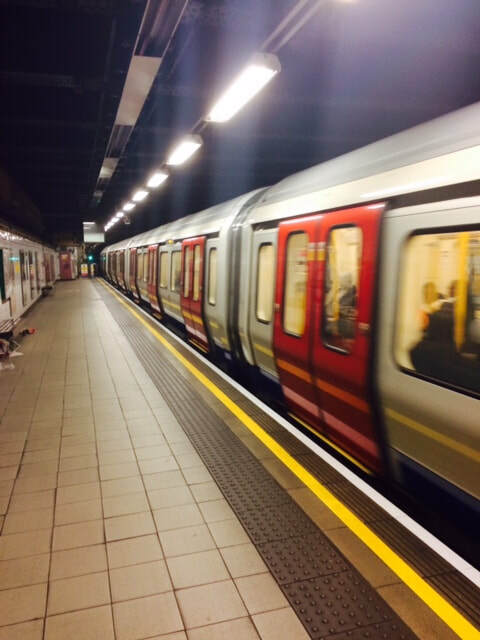 It seemed strange to be setting off on a journey in the dark and arriving into the hustle and bustle of the Capital at night. Its always amazing to see how busy London now is, it truly is a 24hr city. The bright coloured lights lit up the impressive restoration of Brunel's Paddington Arches. As we walked from the train, passengers raced for the tube, taxi's and buses barely giving the historic views a second glance. Londoners seem to have no time to stop and gaze at such engineering wonders. 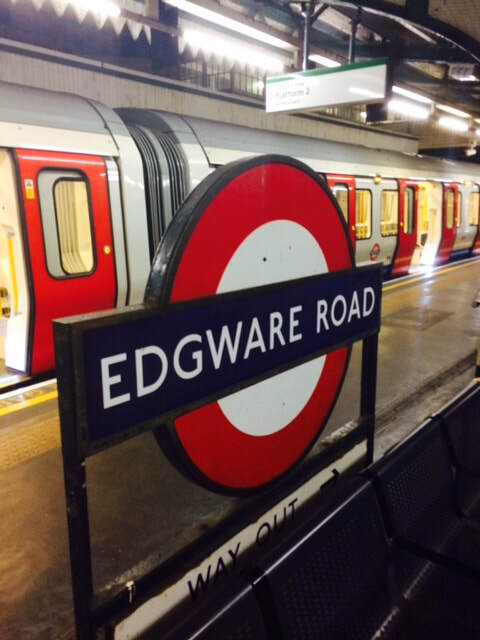 ​After a quick pit stop for supplies we headed down onto the tube, taking the Circle Line one stop east bound to Edgware Road to change trains at the quirky point where the Circle Line isn't actually a circle any more because trains start and finish at Edgware Road. Unravelled it's effectively a straight line end to end. 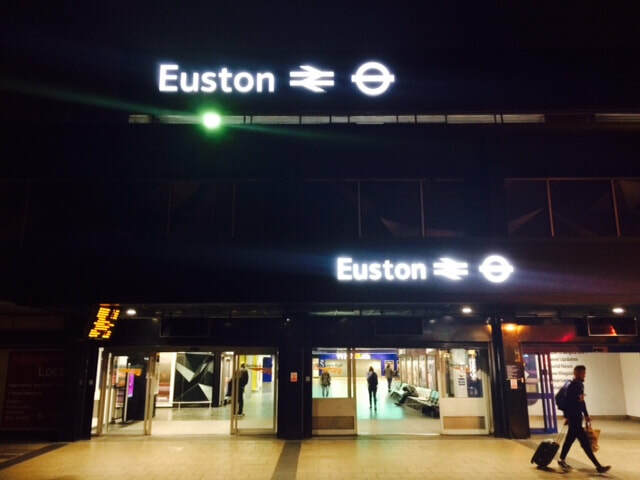 After a short pause at Edgware Road we continued to Euston Square where we exited for the short walk to London Euston station, where we quickly visited Euston's Platform 1. 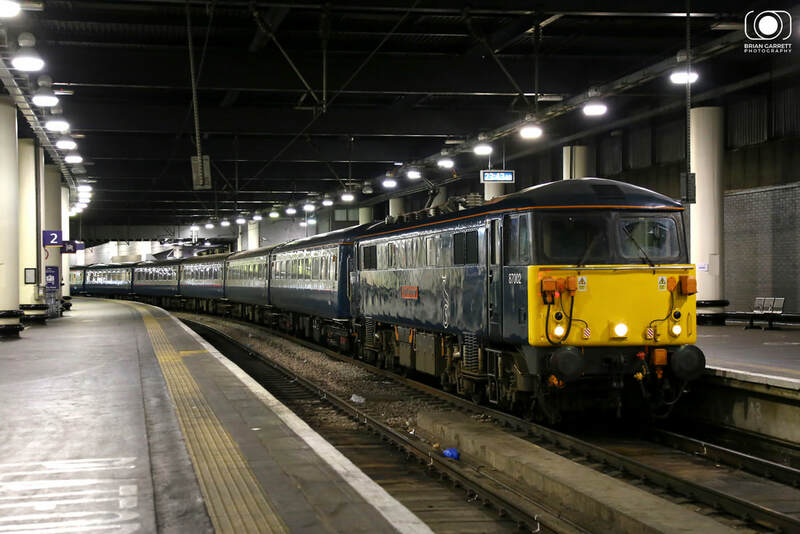 Here we knew there would be the empty stock locomotive which had arrived from Wembley hauling the Caledonian Sleeper. A heritage electric Class 86 locomotive No. 86101 'Sir William Stainier FRS' was stabled. The locomotive having detached from the coaching stock. 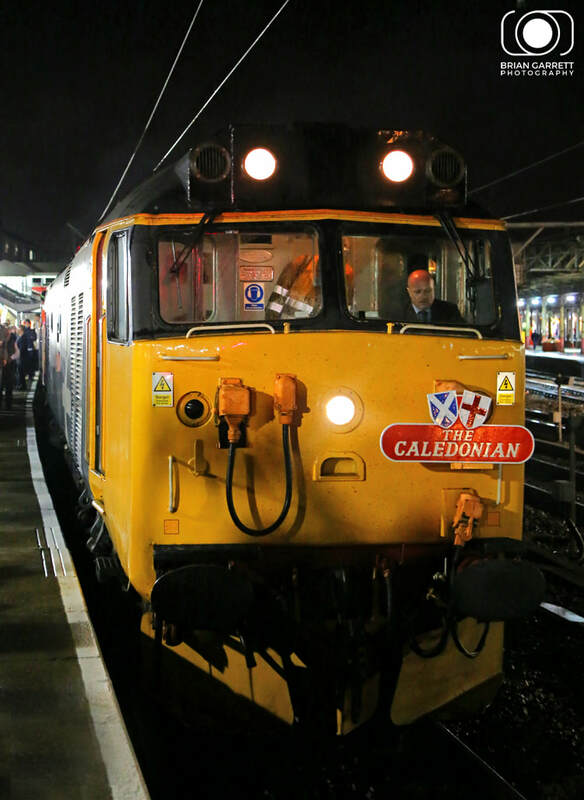 Euston now has gate line staff who kindly let us photograph the locomotive. We then all walked the short distance to the Euston Premier Inn for the night as our real journey would begin in under eight hours time. ​The alarm bells rang out at 04:40 and we were awoken from our semi state of conciseness. Seconds after awaking the phones began to buzz and ring out with excitement. 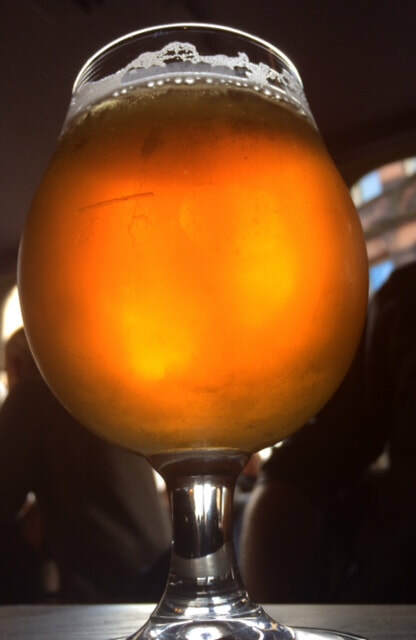 The others were already chatting on social media speculating about times, arrivals of stock and workings, where as I was barely able to raise enough of an eyelid to see my way to the bathroom. After a quick shower to wake ourselves up it was soon time to meet in the lobby at 05:30 ready for the short walk over to London Euston station. As we exited the hotel a steady stream of enthusiasts were already on a migration to the station, easily spotted amongst the early morning London Traffic, the simple stooped posture plodding along Euston Road in a westerly direction and backpacks giving their chosen pass time away. Arrival at the station found 86101 still stabled on the blocks, in the same position it had been the previous night after it arrived with the Sleeper Empty Coaching Stock from Wembley Yard. 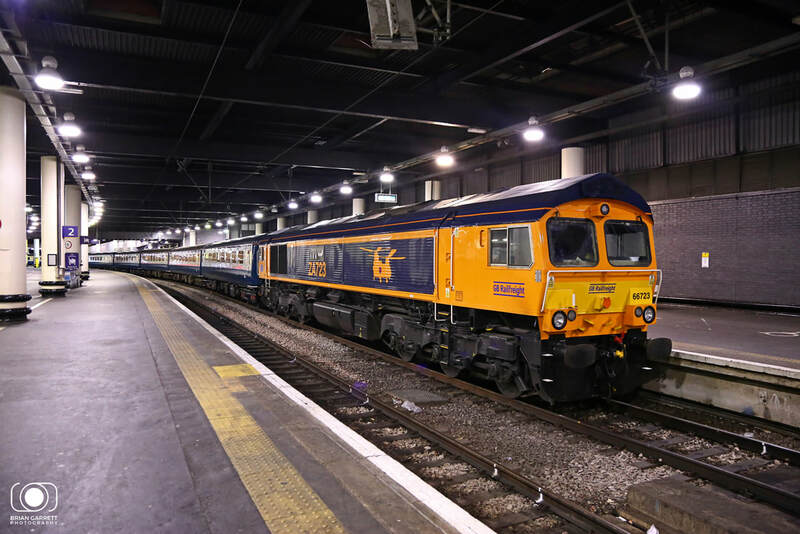 Gbrf's Class 66/7 No.66723 was then stabled short of the 86 having hauled our Mk2 BR Blue coaches for the tour overnight from Burton On Trent which had arrived into Euston at 05:20. 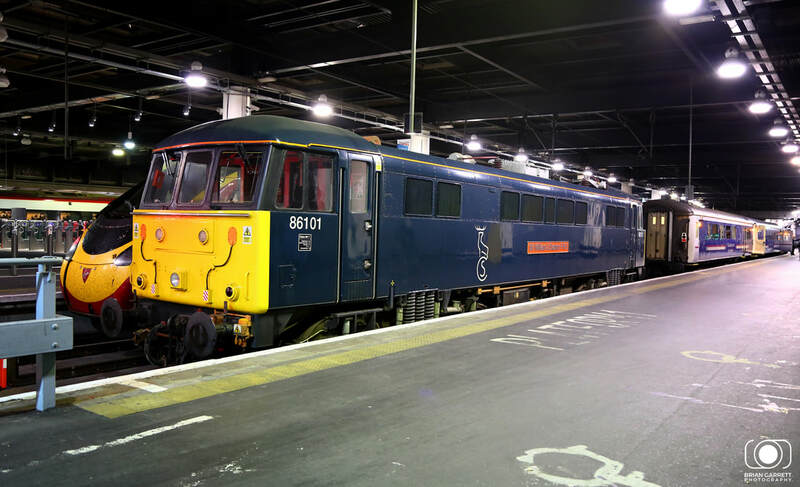 Gbrf Class 87 No.87002 then dropped onto the front end of the train, with the locomotive painted in Scottish Caledonian Sleeper livery. As enthusiasts headed to the front of the train for a glimpse of the locomotive which would be hauling us the first 158 miles to Crewe, we settled into Coach G. The Coach was previously a Virgin Trains West Coast First Class coach, but was now painted in resplendent British Rail Blue/Grey. It had spent many years racing up and down the West Coast during its life. 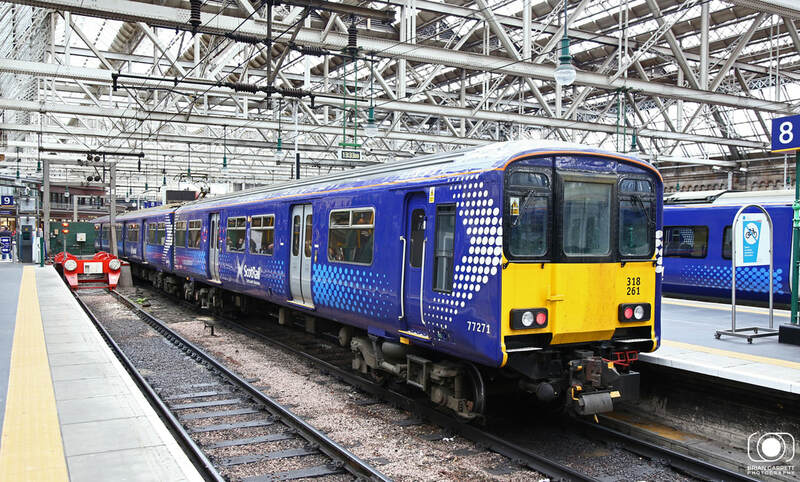 The train (all bar the front coach) was a fully BR Blue Liveried set. ​Departing London Euston at 06:13 GBRf Class 87 No. 87002 'Royal Sovereign' hauled the train into the darkness, it would be several hours before the sun would even be thinking of poking it head above the horizon. Speeding past the suburbs of London as many were still in bed, curtains closed and lights off. The friendly staff on board came and introduced themselves and soon has us filled with coffee and bacon rolls, the first stops of the day Watford Junction, Milton Keynes, and Rubgy soon came and went. Just before Nuneaton the first game of the day was bought out to start the entertainment. Jenga was a passing amusing joke but once of our group turned it into reality by bringing the popular wood block game onto the train. It was soon out on the table with three of us playing trying to outwit the swaying of the train against the normal balance issues, even the on board staff were taken by the novel idea. Needless to say it wasn't long before the first set of point work learched the coach to one side and collapsed the Jenga tower onto the table. At Nuneaton we picked up a large quantity of passengers. We arrived at 07:40. By then we had already been awake for two hours. Two more of our group joined us here. They settled in just as croissants and next round of coffee was being served, which pleased them. Our coach soon filled up here with enthusiasts all keen to enjoy the days travel to Scotland being hauled by classic British traction. After a brief pause at Stafford where 66041was sighted working the Avonmouth to Clitheroe cement. It was the final leg of the journey for 87002 before the traction highlight of the day was added to the front of the train. Class 50s No.50007 'Hurcules' and No.50049 'Defiance' had worked up from Kidderminster earlier in the morning and were waiting for our train to arrive at Crewe, ready to take us to Glasgow. 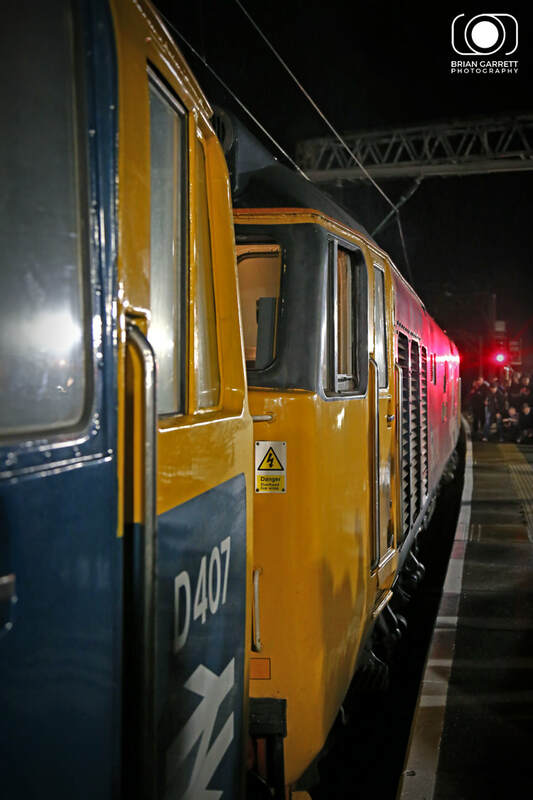 Once the Class 87 had been removed from the front of our train and the Class 50's added, passengers sprinted back to their designated seats within the train, the coaches filled with the heavy breathing of unfit middle aged men, all overheating and out of breath from the brief exercise to the platform ends and back. Another of our group joined us at Crewe having driven down from Lancaster. 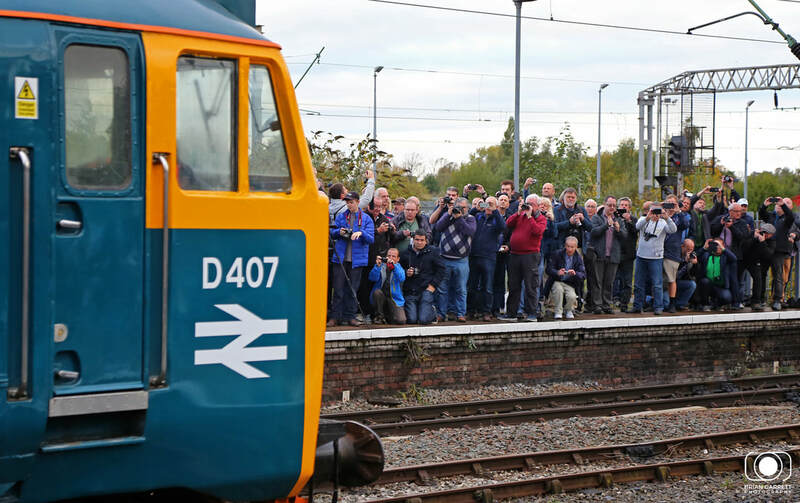 He had set off early to drive down to Crewe and join us for the 486 miles of Class 50 haulage from Crewe to Glasgow and back. After some initial confusion from someone turning up claiming they had an allocated seat number in our batch of seating, it turned out that our spare ticket reallocated by Pathfinder and he was moved to another location in the train. The only downside for us dropping to 9 people meant that one person was separated from the group, but we soon worked around that with stints sat on the chair arms and switching seats once in a while. 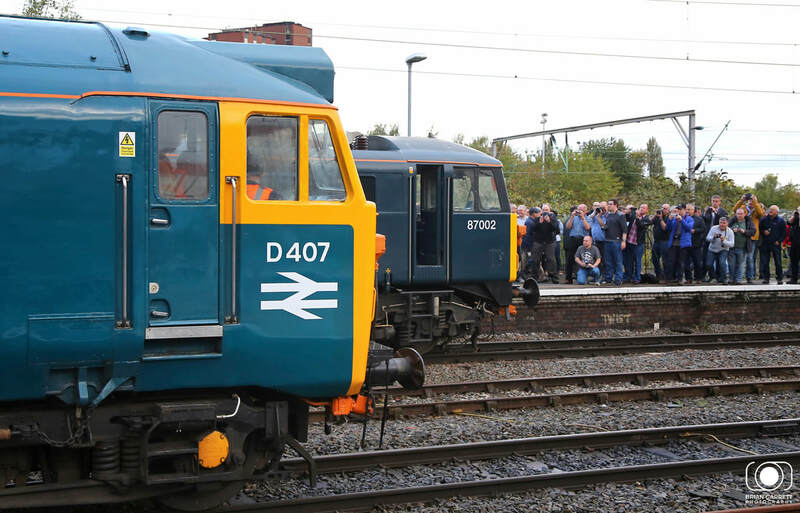 The Class 50s wasted no time in getting up to speed, with Warrington, Wigan, and Preston passed with regular speeds of 90-95mph were achieved. Climbing to the summit of Shap was held at a respectable 70mph most of the way up dropping to 63mph at the summit. 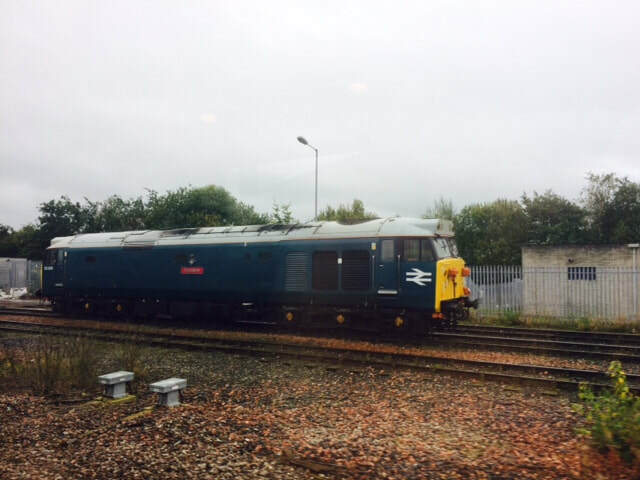 ​​Rolling into Carlisle the available vestibule windows soon filled up, as news had filtered through the train the another Class 50 No.50008 'Thunderer' owned by Garcia Hanson had been stabled outside Carlisle Panel Box having worked a rail grinder to Carlisle the previous day. Beattock was a non starter as we were booked to stop in the loop at the top of the bank. The locomotives held 50mph most of the way up but then backed off for the stop in the loop. The booked pathing spot allowed time for the 50s to take a breather before continuing the final 52 miles through to Glasgow. Once a Virgin Trains service had passed by we were given the green light to continue. Beer was started at 11:30 with the first pint of ale poured at the bar, we felt the top of Beattock Summit was as good a place as any to drink to the 50's! The run down from Beattock saw us clock 102mph on the downward run and it wasn't long before we were back running ahead of time. The twisting curves on the run down to the Glasgow suburbs giving the occasional glimpse of the locomotives up front as they rounded left hand bends. ​The line side was littered with enthusiasts, photographers, and even drones all capturing the images of our train passing by in real time. The instant nature of social media providing a picture from outside the train to those inside the train just minutes after passing photographic locations. 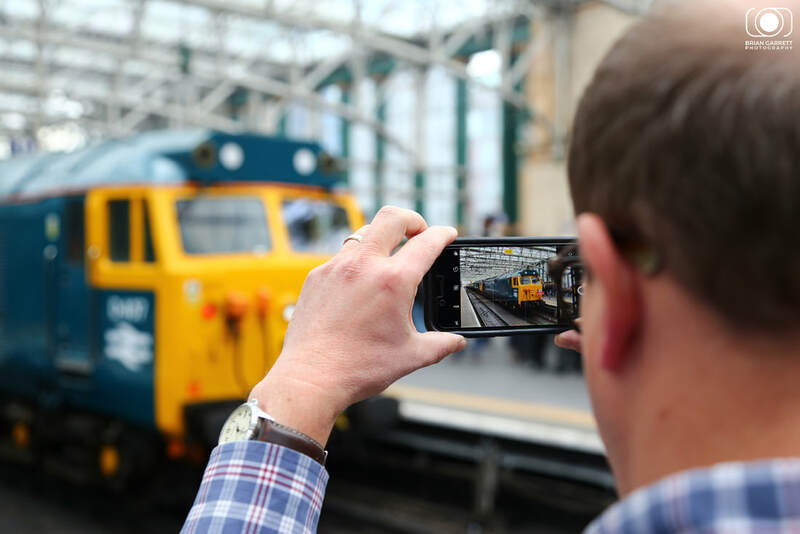 Modern mobile technology had given this railtour a brand new angle, with even the crew posting videos and images from the locomotive cabs, engine rooms and lineside. 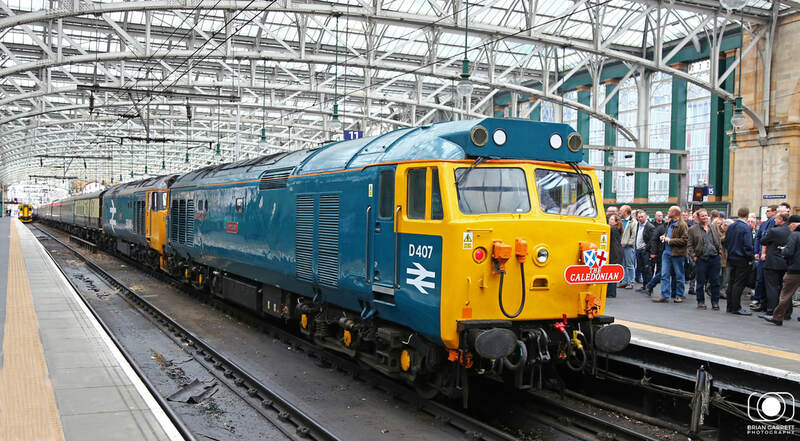 Arrival into Glasgow Central was on time with huge crowds of photographers jockeying for position to get their shot of the 50 year old locomotives which had just hauled us the 243 miles from Crewe. The station concourse resembled bees around a honey pot with photographers all manoeuvring around each other to get their shots. Having grabbed a few shots best I can then re-grouped with the rest of our party we made a bee line for one of the most recent Weatherspoons to open in Glasgow. 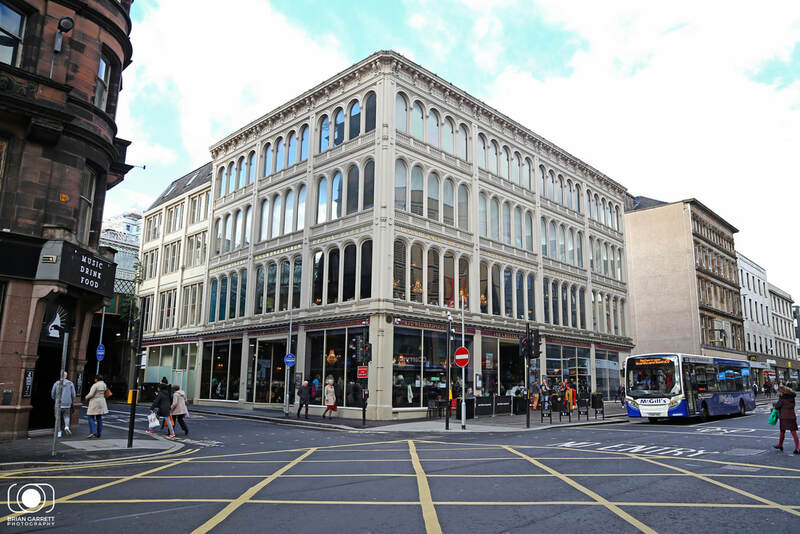 The Crystal Palace is another superb restoration of an 1800's building in Glasgow. 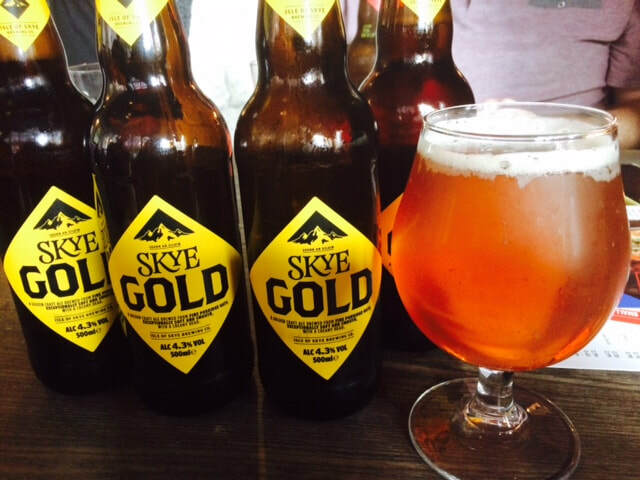 Where we found a table and indulged in a pint of ale brewed on the Isle of Skye, and a cooked meal. The first hot meal since leaving home on Friday evening. After a quick walk around Glasgow the time to depart the city was fast approaching. We returned to the station to find Freightliner Class 90 No.90016 having arrived with the empty stock from Polmadie Depot, the Class 50's already attached to the rear of the train ready to lead us back to Crewe. 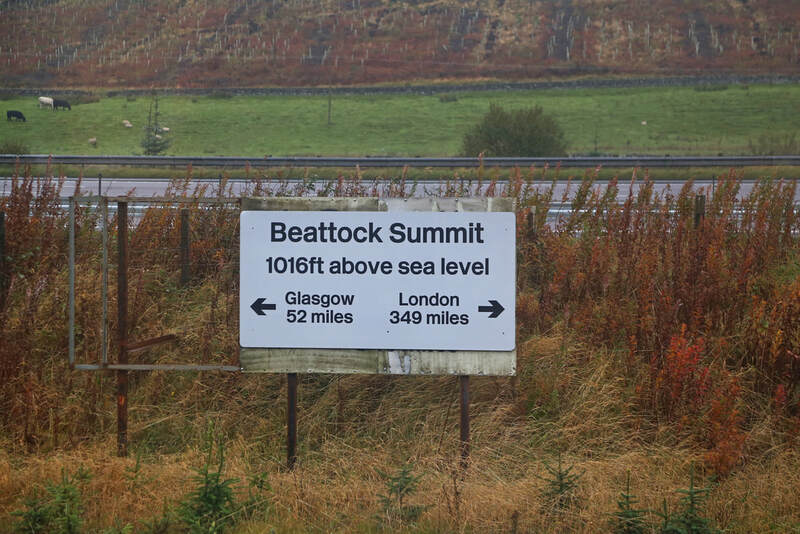 ​The climb to Beattock from Glasgow saw the Jenga out on the table again with the train breasting the summit at 75mph, and the run down the other side was at speeds in excess of 100 mph on regular occasions. The Jenga game at this speed caught the attention of half of the coach as we kept the tower getting higher and higher right up until someone went to point at a block and promptly knocked the entire tower over. It was at this point that the next round of tea and coffee arrived along with biscuits with gave a convenient point to pack Jegna away for the day. After Beattock we had a perloged stop in Plumpton Up Goods Loop waiting for two Virgin Trains services to pass by. After the stop we got underway and easily hit 100mph on the first half of the downward run to Penrith Loop. Sadly for us we had to follow a late running all stops Pendilino which resulted in a hasty brake of from 100mph to 40mph in under a minute. This bought us to a slower sedate pace which was by no means in a par with the speeds we could of been running at earlier in the day. With fading light and slow running we soon turned to playing cards to pass the time between there and Crewe. We didn't notice the time going by or the speed we'd eventually picked up. The residents of Preston were treated to a display of raw English Electric noise, as we approached the station we exited from a temporary speed restriction, as we entered the covered section of the roof, the sheer might of the Class 50's was unleashed with passengers shocked as we stormed through non stop with the noise reverberating around the enclosed canopy roof. A small child was see with his hands over his ears, another couple jumped back from the platform edge, it was a fine performance which was also reportedly heard in Preston town centre as well. There was more spirited running between Preston and Crewe we made up time and arrived into Crewe on time. It was here the first of our party departed and returned north back to Lancaster a station, which he had passed through and hour and a half earlier on the train. At Crewe I joined the scrum at the front of the train to try and get those last couple of shots and appreciate those English Electric engines on last time on their last departure from Crewe as they were uncoupled to depart from the train. For the final departure they did not disappoint and provided two boughts of engine blasts for enthusiasts to enjoy as they left the train to return to their base at Kidderminster. 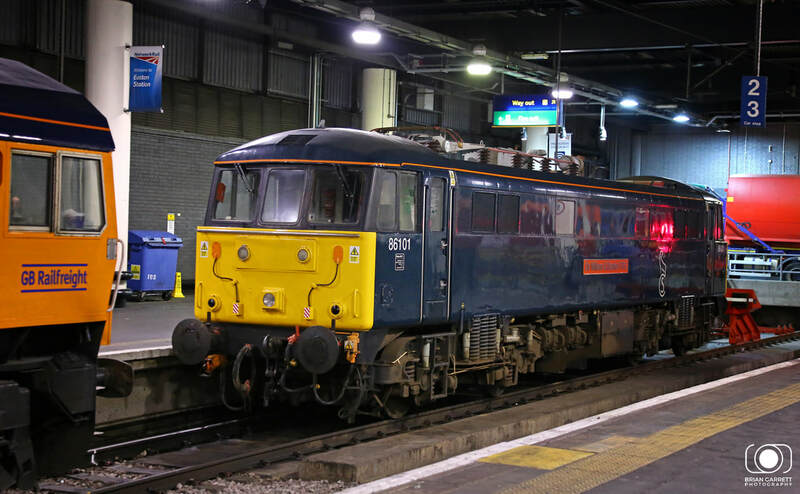 ​It was at Crewe where we re-attached our Class 87 from the morning run, No.87002 had been stabled in Crewe all day waiting for our tour to return. Once attached the veteran Locomotive in its own right (and a fellow operator of The Caledonian and Royal Scot services) had been coupled it was time to depart into the darkness once more. Stafford, Nuneaton, Rugby, Milton Keynes, Watford soon emerged out of the dark autumn night and weary but satisfied passengers slowly packed away their belongings, took their last gulps of beer, put their bags on the their backs and began that stooped trudge back to their cars, taxi's, wives, girlfriends, and homes. ​To reflect the tour, it was like one of old. After 50049 and 50031 were split up and ended their pairing on the mainline on the late two thousands only a handful of mainline Class 50 Charters have been able to operate. 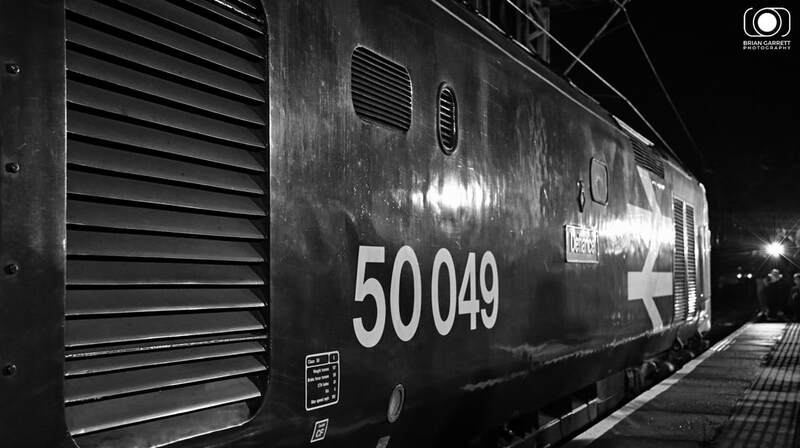 Full credit should go to The Fifty Fund for putting together a new pair on the shape of 50049 and 50007, and slowly building up their reliability but by bit with regular running at their base on the Severn Valley Railway and then phased workings on the mainline to slowly iron out any niggles and problems over a number of years. It must of required a large amount of dedication and planning to build them back up for such a long distance run over such demanding gradients. 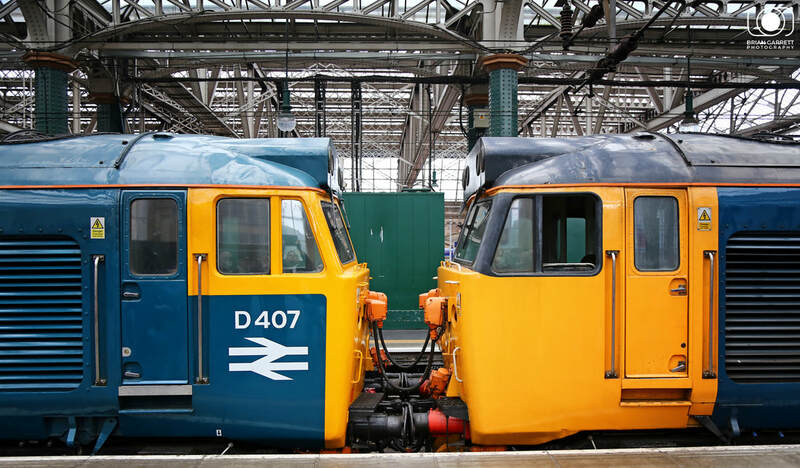 The faultless performance proves that with the right care, attention, planning and dedication that the Class 50 still has what it takes to provide a truly unique sound and experience on the UK rail system. The tour itself was very well orgnaised, the staff on board worked incredibly hard keeping people fed and watered throughout the day. 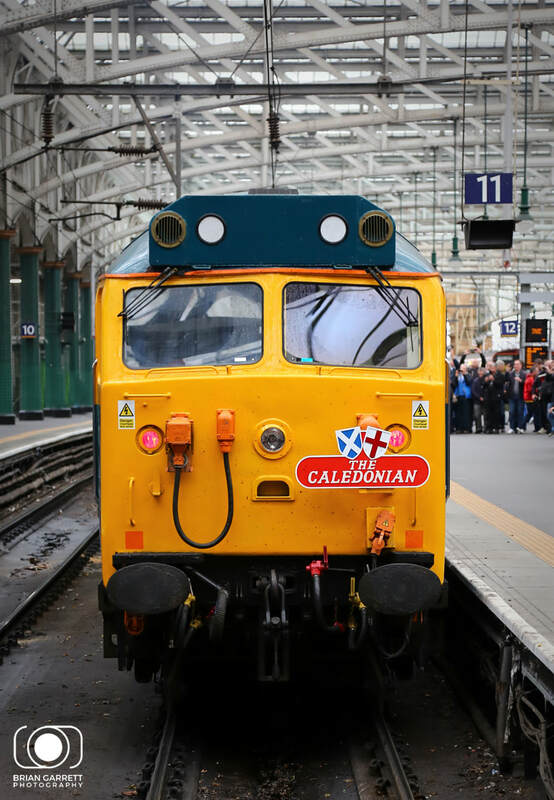 ​ It was also great to see nearly £4000 raised for charity via the on board raffle and seal bid for the Caledonian Train Headboard. 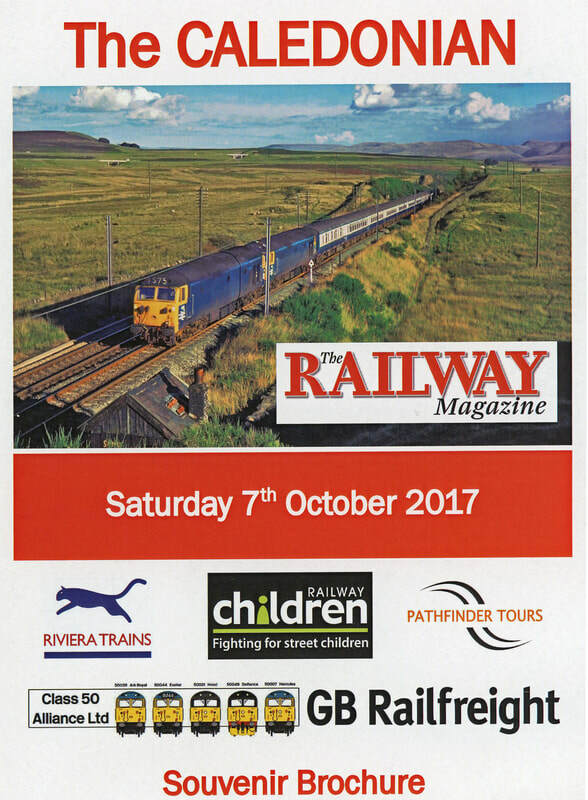 The Railway Children charity will benefit from such a large donation for the work it carries out with homeless children in the UK and abroad. From a personal point of view my love of the Class50 will always be up there with there with the best of them, having now clocked up 2462 miles behind 50049, it truly cements this class at the top of my haulage list. 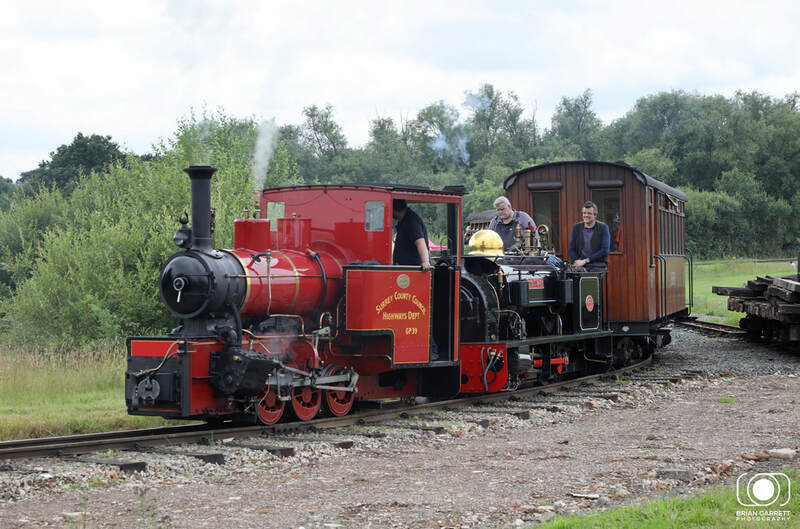 It's already been announced that April 2018 will see another anniversary tour using these 50 year old locomotives. Where do I book!? ?